These singles will contain at least 5 frames of bees with an established laying queen (Italian/Carniolan hybrid). 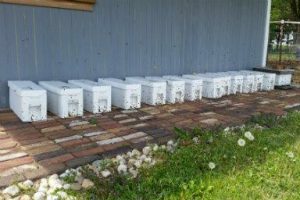 The unit comes with 8 frames, a division board feeder, a newer deep hive box to hold the frames and bees, 1 used lid, 1 NEW bottom, and 1 used staple-on winter wrap that is cut for two-deep overwintering. This is a much better deal than packages or nucs if you need equipment. They will grow very quickly, so please be sure to have another hivebody with frames when they are ready for more room. These singles will be ready in the first half of May. You will be notified about pick-up when they are nearly mature. Download our Order Form if you prefer to mail in and pay by check (3% discount). Singles cannot be shipped and will need to be picked up from our Mount Vernon location. Please select which location you prefer for pick up. Are you going to need honey containers this year? Pick them up when you pick up your nuc! Please go ahead and order your containers NOW so that we can plan inventory and have your order ready for pick up! In the “Notes” section, please let us know that you will pick up your containers with your nuc order. Thank you for choosing Ebert Honey! Want to start fresh? 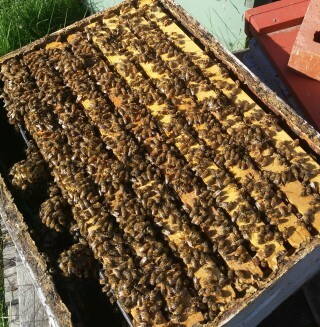 You can purchase a single deep hive and get a head start on the season!